Article in SD Reader, April 2, 2015. The little flap that we helped uncover recently over Navy waste water being flushed out over Sunset Cliffs and into the ocean seemed to have been the first exposure of this practice by the Navy, the flushing of potable water. 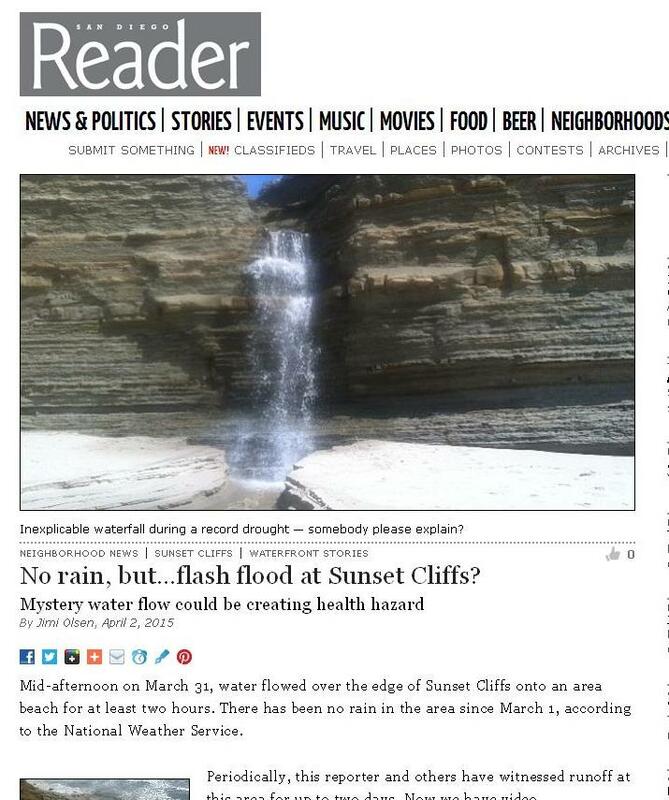 Yet, we have found an article from last April in the San Diego Reader that discussed the very same flushing at the same location. 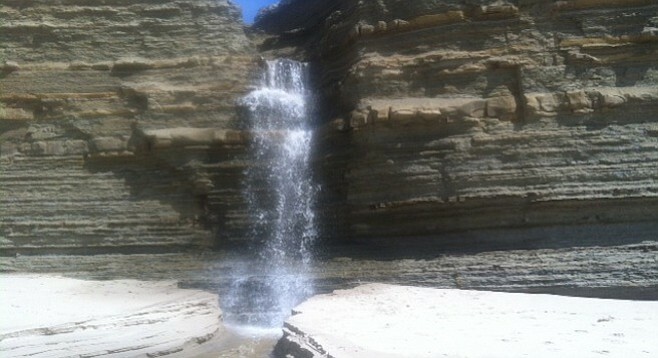 Look at the photos of the water cascading out from the cliffs. It’s the same location. 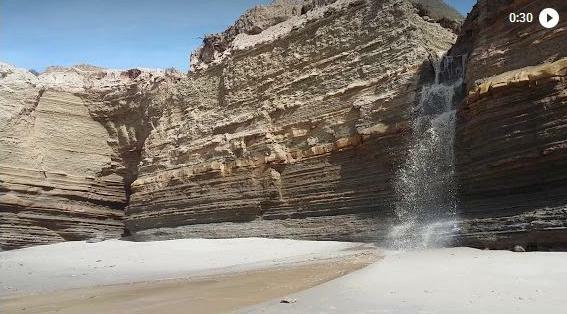 Mid-afternoon on March 31, water flowed over the edge of Sunset Cliffs onto an area beach for at least two hours. There has been no rain in the area since March 1, according to the National Weather Service. Periodically, this reporter and others have witnessed runoff at this area for up to two days. Now we have video. Olsen goes on, attempting to connect the water run-off with the illness suffered by 4 surfers – one whom died. The last time water ran off this bluff was the weekend before Christmas  during a rainstorm. At least four surfers got sick. Two went to the hospital and one, Barry Ault, died. The Centers for Disease Control got involved and monitored Ault and the other surfer that was hospitalized. They were diagnosed as having contracted an infection from the Vibrio parahaemolyticus bacteria. The bacteria is present in ocean water and thrives in brackish water or when fresh water runs off into the sea. Warm to moderate ocean temperatures also help the bacteria to bloom. Meanwhile, according to maps, tracing the canyon above the runoff site leads to Building 60, the US Space & Naval Warfare Systems site on the west side of Catalina Boulevard. Nearby are two water tanks and a pipeline operated by the City of San Diego Wastewater Treatment Plant; however, it’s unlikely that any unintentional discharge would have flowed into the canyon that led to the bluff. Around mid-day on April 1, the video was sent to Brian O’Rourke, media relations officer at Navy Region-Southwest. He said he would look into the situation but as of 4 p.m. on April 2, he had yet to respond. Issues raised by the more recent exposure of the flushing have not been resolved. Why is the Navy releasing so much good water in a time of drought? What are the consequences to plant life and sea creatures of pouring 1,000s of gallons of fresh water into the ocean? And is the military causing undue erosion to protected cliffs? I am pretty skeptical about this “Routine Flushing of Potable Water”. Why did they flush this water for 2 days? Why did Barry Ault die? Why did 3 other surfers get sick? Why hasn’t Brian O’Rourke done anything? It is Mid-November, and he was contacted in April ! If your Water-resources engineer says the flow is “significant”, then why aren’t you listening to him! Newer Article: Blogger Rant: What Can Ocean Beach Park – a “Dedicated Park” – Be Used for? Surf-Camps? Surveillance Cameras?